Wisconsin Gov. Scott Walker (center) is greeted by his Cabinet and staff Wednesday at the state Capitol in Madison, a day after defeating Milwaukee Mayor Tom Barrett in a recall election. Earlier Wednesday, Walker thanked voters at a factory outside Milwaukee. It's a scene he repeated almost daily in the final weeks of the campaign — shaking hands with workers and executives on a factory floor. This time, instead of asking for their support, it was the raspy-voiced Walker's turn to simply say, "Thank you." Walker made brief remarks at a metal fabricating plant in the Milwaukee suburb of Oak Creek. He told supporters his resounding victory shows that Wisconsin voters appreciate his efforts to rein in state government spending, "but we're not done yet," he told the audience. Walker says many businesses in Wisconsin may have been holding back on expansion and hiring plans until knowing the outcome of the recall election. Among the next moves he plans in the state capitol, Walker says, he and lawmakers need to loosen environmental regulations and enforcement actions that he says are stifling job growth. "We still want clean air, clean land, clean water. We want public safety and public health, but you can enforce things that are based on common sense and not just on bureaucratic red tape," Walker says. However, Walker does vow to change his ways, telling reporters he realizes he needs to drop the more divisive approach that sparked the recall effort against him. "While the final product is good, fixing things is good. So is making sure that you talk about it, that you do more to include people in the process," Walker says. The governor says he'll start by bringing all state lawmakers — from both parties — together for burgers, bratwurst and some good Wisconsin beer. Bill Hoff, 42, is a supervisor at the Steelwind Industries fabricating plant where Walker spoke Wednesday. Hoff says he likes what he hears from the governor. He says Walker seems to have emerged from the bruising recall fight unscathed. "I think, if anything, he's gotten more popular," Hoff says. Outside the plant, Human Resources and Safety Director Angie Trentadue sees a governor who may now be ready for bigger things. "[I] wouldn't mind seeing him in a presidential election ... in a couple years, or even a vice presidential election," Trentadue says. Some even say Walker should now be on Mitt Romney's short list of possible vice presidential candidates. "I think this is going to catapult him into the national view as a real hero," says University of Wisconsin, Milwaukee, political scientist Mordecai Lee. "He took the hit. He took the best blow that the left could throw at him and he survived and he survived comfortably. So he is now a national symbol of standing up to the enemies of the right." But being on the ticket with Romney might be a stretch. There's an ongoing corruption investigation into the Milwaukee county executive's office — the post Walker held before being elected governor. Several of his former aides and associates have been charged with crimes ranging from embezzlement to campaigning on county time. 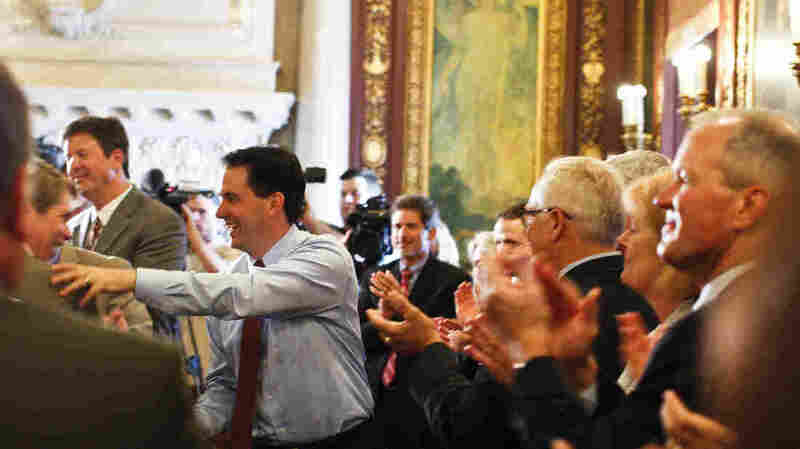 The governor has not been implicated, but the investigation is a cloud hanging over Walker and his historic victory.